Renovation and Property Styling by Design + Diplomacy. Photography by Dylan Lark of Aspect11. 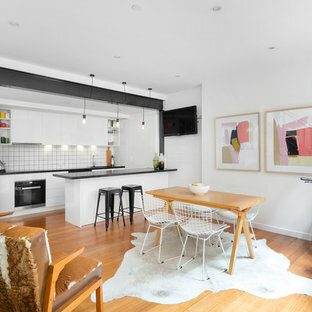 Photo of a small scandinavian kitchen/dining combo in Melbourne with white walls, medium hardwood floors and brown floor. 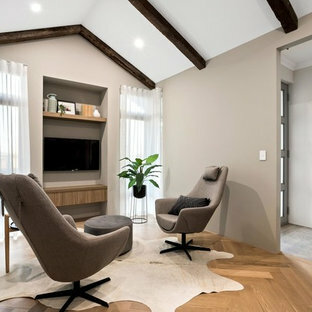 Design ideas for a contemporary family room in Perth with beige walls, light hardwood floors, a wall-mounted tv and beige floor. 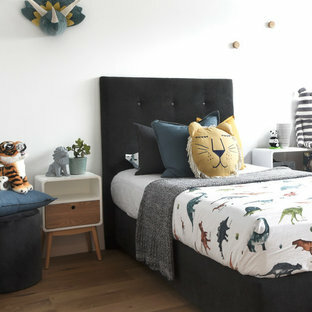 Contemporary gender-neutral kids' room in Sydney with white walls, medium hardwood floors and brown floor for kids 4-10 years old. 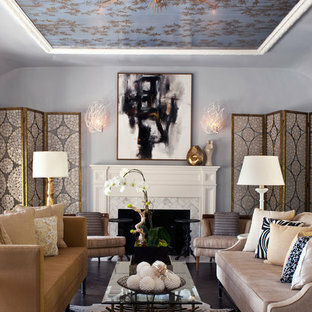 This is an example of a transitional living room in Los Angeles with blue walls and a standard fireplace. Design ideas for a contemporary home office in Austin with blue walls. Inspiration for a traditional walk-in wardrobe in Houston with white cabinets. By Archer & Buchanan Architecture, Ltd.
Design ideas for a large traditional formal open concept living room in Philadelphia with beige walls, no tv, carpet, a standard fireplace and a stone fireplace surround. Tropical plantation architecture was the inspiration for this hilltop Montecito home. The plan objective was to showcase the owners' furnishings and collections while slowly unveiling the coastline and mountain views. 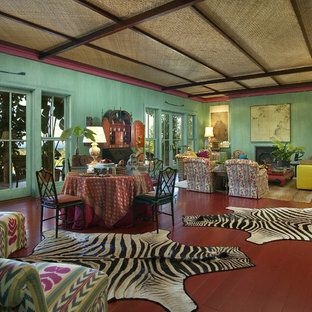 A playful combination of colors and textures capture the spirit of island life and the eclectic tastes of the client. 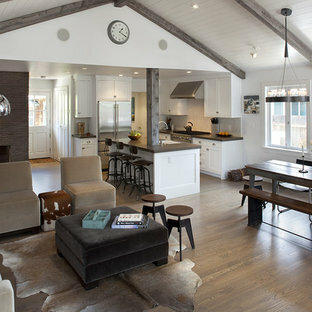 Country open concept living room in San Francisco with a standard fireplace. This is an example of a traditional home office in New York with white walls, dark hardwood floors, a freestanding desk and black floor. A custom made hand hammered silver head board sits proud above the bed in this master bedroom. Two different rough wood dressers are used as nightstands and above them sit these vintage mercury glass lamps (Italy, 1950's). An oversized custom wool and silk blend rug sets a muted backdrop so lavenders and grays can come through the linen fabric used for the window treatments and bedding. Sferra bedding is used as the basic white, and custom made pillows tie the room together. White and silver cowhides cover portions of the large rug. A daybed sits in front of the king size bed, providing another layer of softness in this room. Contemporary wood staircase in London. Photo of a contemporary dining room in Chicago with beige walls, dark hardwood floors and brown floor. Inspiration for a mid-sized transitional master bedroom in New York with purple walls, carpet and no fireplace. Design ideas for a transitional home office in San Francisco with brown walls and medium hardwood floors. This is an example of a traditional living room in Charleston with blue walls and a brick fireplace surround. Photo of a transitional living room in Minneapolis with a standard fireplace and a wall-mounted tv.